Karen Laura Thornber’s Ecoambiguity: Environmental Crises and East Asian Literatures presents a generously varied array of ecological works from the literatures of China, Japan, Korea, and Taiwan. Joining a seasoned comparatist’s command of the original languages with a world literature advocate’s interest in bringing notable writing to a wider audience, she discusses telling intricacies of attitude, imagery, phrasing, and unfolding structure in her chosen texts, many of them previously untranslated. In the process Thornber introduces comparatists who work with cross-cultural issues in other geocultural regions to the richness of the East Asian archive, both in its own right and in its implications for the discipline overall. To enhance the book’s usefulness for readers unversed in the East Asian situation, she frames her nuanced accounts of specific literary works with a survey of the region’s different tempos and modes of industrialization and modernization and of the ecological problems that resulted. This body of writings, she contends, should dispel the lingering stereotype that associates East Asian culture with Buddhist ideals of harmony with nature. Above all, Ecoambiguity pinpoints the many ways that these works register intractable, even paradoxical encounters with humanity’s ever-present urge to instrumentalize the natural world. 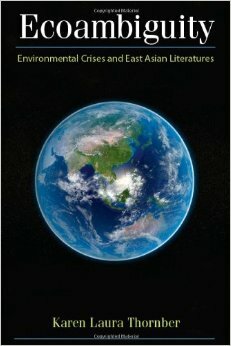 Holding that East Asia is distinct but not unique in this regard, Thornber brings comparative literature’s concern with studying the illuminating entanglements among the world’s literatures to bear on ecocriticism. She invites this emerging form of literary inquiry to give new richness and depth to its planetary concerns, to recognize in a fuller transregional sense that ecology and environmental crisis know no borders. 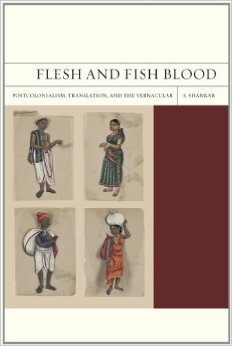 Flesh and Fish Blood: Postcolonialism, Translation, and the Vernacular by S. Shankar is a major contribution to comparative and postcolonial studies. The book develops a strong, well substantiated argument for the value of “vernacular knowledges” that have been overlooked in the current vogue for hybridity and the transnational. Taking such vernacular knowledges seriously, Shankar argues, allows us to more fully acknowledge the role of the local and the traditional in cultural self-understanding and political struggles for autonomy. Flesh and Fish Blood offers nuanced readings of a variety of Indian texts in Tamil, Hindi, and English, defending them against charges of provincialism or nostalgia by showing that attention to local concerns is entirely compatible with intellectual sophistication and aesthetic richness. Tamil literature, especially, emerges from this description as a major cultural site for the development of postcolonial theory and a worthy rival to the Anglophone canon. These readings are embedded in a judicious and wide-ranging discussion of such topics as nationalism, humanism, and translation, along with a powerful concluding defense of the methodology and practice of comparison. Over-all, Shankar’s book combines theoretical sophistication, deftness of interpretation and an impressive clarity and cogency of argument. It makes a compelling claim for rethinking postcolonialism within the framework of comparative vernacular literatures and makes a much needed case for a more capacious curriculum.